Kalaranjini is an actress from Kerala, India. 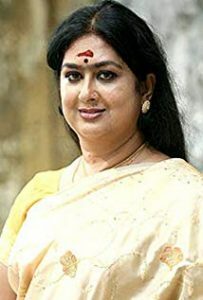 She was born on 24th May 1962 at Kerala, India. Her father’s name is Chavara V.P. Nair. Her mother’s name is Vijayalakshmi. She has two brothers. Their names are Prince and Kamal Roy. She has two sisters. Their names are Urvashi and Kalpana. Check out the table below to get complete information on Kalaranjini. Kalaranjini’s height is 5 feet 4 inches and her weight is 65 Kg. Her age is 56 years.